I used a quick and easy layout for this card. I cut a couple of pieces of the designer paper and then over laped them a little to hide the seam. 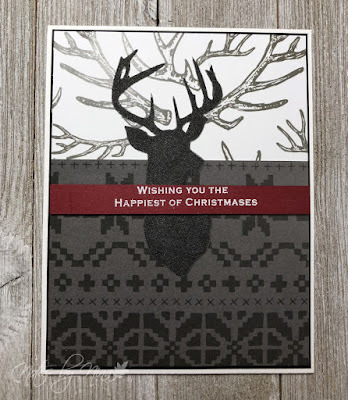 I cut the buck head from a large grey glitter paper then I heat embossed the sentiment in white and popped it up with foam tape. Supplies: White and black cardstock, Designer Paper - Wild Whisper, Woodware-Happiest, misc die cut.